ATN NVBNNSDW3P Night Shadow 3P ITT Pinnacle Night Vision Binocular FREE SHIPPING! The ATN Night Shadow 3P ITT Pinnacle is a powerful night vision binocular system, designed for long range observation in low-light conditions. Its 5x magnification and premium all-glass, multi-coated optics provide exceptional clarity and contrast at long distances--perfect for performing surveillance operations from a safe distance. It features cutting-edge SMART Technology, which uses a proximity sensor to automatically activate the device when held in a viewing position and deactivate it when lowered, preserving battery life for longer run times in the field. The binoculars integrate automatic brightness adjustment and bright light cut-off systems to provide a consistent image and protect the intensifier. This system is supplemented by user-friendly digital controls. In zero-light conditions, the binoculars' infrared illuminator delivers continued visibility. The binoculars are weather and fog resistant for use in all weather conditions. ATN ensures this device is compatible for use with cameras to record evidence during surveillance operations. 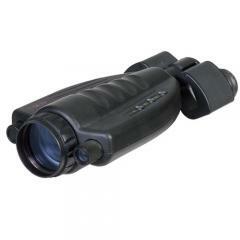 ©2002-2019 CopsPlus.com: ATN NVBNNSDW3P Night Shadow 3P ITT Pinnacle Night Vision Binocular FREE SHIPPING!